Juanita Wallace, member of the West Atlanta Watershed Alliance and Proctor Creek Stewardship Council, grew up on Proctor Creek in Atlanta. This past year at a session she co-led at River Rally, she recounted her connection to Proctor Creek and described how the creek has influenced not only who she is as a person, but how it shaped her becoming involved with the Proctor Creek Stewardship Council. Juanita grew playing in the creek on hot summer days until she moved away when she grew up. Upon her return to the area years later, she said what she saw made her “sick” – microwaves, trash, and other debris in the creek. The creek was devastated. Because of her familiarity with the neighborhood, she was asked to become involved with the Proctor Creek Stewardship Council, and it was her passion for the creek that sparked her involvement with local efforts. Proctor Creek begins in the heart of Atlanta and flows west through low income, predominantly African-American neighborhoods with a final destination being the Chattahoochee River. Combined sewer overflows (CSO), litter, and illegal tire dumping have contributed to significant pollution, bank erosion, and bacteria in the creek. What was once a community jewel is now a threat to the public health of surrounding communities. 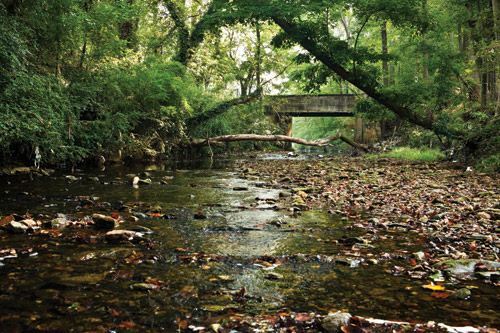 For Proctor Creek, local community knowledge is the key to effective, long-lasting change. It is easy for an outsider to come in and say, “This is what we should do to fix it.” But community residents like Juanita Wallace have observed the waterway over many years and seen the changes that have taken place. All too often, the outsiders coming in to “restore” the watershed or solve the local stormwater issues do not take into consideration the local community’s wants and needs for the watershed. Sometimes they don’t even let the community know what they are planning! Utilizing local knowledge turns community residents into researchers who are able to speak for the creek, giving presentations and coauthoring important watershed studies to develop recommendations for restoring the creek that are rooted in the community. According to Darryl Haddock, Environmental Education Director for the West Atlanta Watershed Alliance and Ms. Wallace’s co-presenter in the same River Rally session, local, community knowledge is just as important as academic knowledge. Led by this principle that community voices must take the lead in shaping the future recovery of their environment, community organizations such as ECO-Action, West Atlanta Watershed Alliance, and Proctor Creek Stewardship Council collect data, promote civic engagement, and install green infrastructure projects in an effort to restore Proctor Creek to its former glory. In 2013, their hard work was given national recognition when the Proctor Creek watershed became an Urban Waters Federal Partnership designated area, an EPA-led effort to improve coordination among federal agencies and community-led, water revitalization efforts. Interested in learning more about Proctor Creek and Atlanta?